We’d love your help. 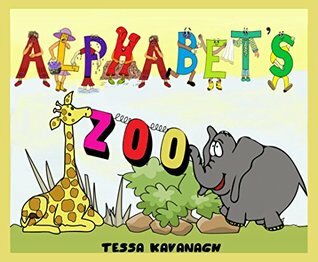 Let us know what’s wrong with this preview of Alphabet's Zoo by Tessa Kavanagh. A rhyming story full of amazing animal pictures, fun letters, and extra riddles. The letters of the alphabet are hatching a plan to create a zoo. But which animal does each letter pick? Who are their favourites? Beautifully illustrated picture book with fun on every page. To ask other readers questions about Alphabet's Zoo, please sign up. I read this book in a matter of minutes and loved every page! The illustrations and rhymes are engaging (I'm a sucker for a great rhyming book) and the story makes sense. Many times, when an author writes a rhyming book, it turns out awkward because the author focuses on making the words rhyme to the point that some of the greatness of the story is lost. And while this author chose unique words that most would have been challenged to find a rhyming match for, she incorporated words that taught th I read this book in a matter of minutes and loved every page! The illustrations and rhymes are engaging (I'm a sucker for a great rhyming book) and the story makes sense. Many times, when an author writes a rhyming book, it turns out awkward because the author focuses on making the words rhyme to the point that some of the greatness of the story is lost. And while this author chose unique words that most would have been challenged to find a rhyming match for, she incorporated words that taught the reader something new without causing frustration trying to decipher the meaning of the words. I would proudly display this book on my shelf, if my daycare were still open, and I know my kids would beg me to read this every day. At the moment, it's only available on Kindle, but the illustrations are so beautiful and the book so well formatted that kids can enjoy it almost as much as holding a paperback or hardback book. I loved this adorable letter book. The pictures were a fantastic amalgamation of real animals plus cute animation. Really great for teaching little ones their letters.